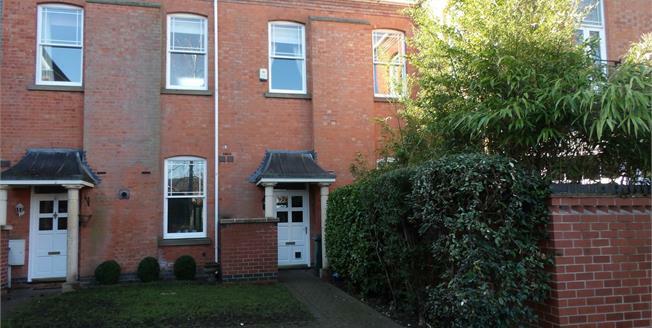 The quiet leafy area of Upper Saxondale is an ideal location and this three bedrooms mews property with its high ceilings and sash windows offers an elegant residence. In brief the property comprises entrance hall, breakfast kitchen, large lounge with two French doors to the garden. To the first floor there are three good size double bedrooms, the master having the added benefit of an en-suite and also a walk in wardrobe, in addition there is also a family bathroom on this level. Outside the property has lawn areas to the front, a single garage and a delightful and immaculately presented rear garden. A viewing is strongly recommended. Access to the entrance hall is via a hardwood, wood floor, double radiator, glazed oak doors to the kitchen and lounge, stairs leading to the first floor. A well appointed kitchen, with a range of modern wall mounted and base units, with granite effect work surfaces, integrated gas hob, double electric oven, dishwasher, washing machine, fridge freezer, cupboard housing boiler, inset stainless steel circular sink with mixer tap over and separate circular drainer, tiled splash, tiled floor, large double glazed sash window to the front elevation. A stunning room which has been elegantly presented, with two double glazed French doors to the garden, feature fireplace with stone effect mantle and granite hearth, deep skirting, wood floor, two double radiators, tv point. Pedestal wash hand basin, low level w.c, radiator, complimentary half tiling. Doors leading to various rooms. A beautiful room with a large double glazed sash window to the front elevation, radiator, walk in wardrobe with hanging rails and shelving. Corner shower cubicle with wall mounted shower, pedestal wash hand basin, low level w.c, double radiator, double glazed sash window to the front elevation, tiled floor. Large double glazed sash window to the rear elevation, double radiator. Panelled bath with shower over, pedestal wash hand basin, low level w.c, radiator, tiled floor. To the front of the property, there are two lawn area's the first directly attached to the property and the additional area along the footpath, the garage with up and over door is accessed via a walkway and is within a designated area, to the rear of the property there is an immaculately presented garden with patio are for dining and lawn with planted borders, there is access to the green from the gate at the rear of the garden.